I LOOVE ALL THE FOOD! aL MY FRIENDS LOVE IT. wE ARE TRAETED LIKE FAMILY, THE FOOD IS HOT, SERVICE EFFICIENT, AND THE PORTIONS ARE VERY GENEROUS WITH LOTS OF INGREDIENTS YOU CAN ACTUALLY SEE AND TASTE. cOMPLETE TRUST AND A REGULAR CUSTOMER. tHAY DO TAKE AWAYS AND DELIVERIED AS WELL. cOMPARED WITH OTHERS IN THE AREA THIS IS VERY VERY SPECIAL. Best value for money in Chiswick!!!! They provide an excellent £5 Thai meal including a soft drink for lunch. Great atmosphere and is always busy. The food is varied with 11 options for the lunch menu a served in good portions. Definitely a place to try out. I felt obliged to write something after reading the rubbish add posted in 2008, which it really doesn’t deserve. Waiting times vary depending on how busy they are. For lunch you can be done in 45mn. Book before turning up and enjoy!! Used to be a regular, loved the food. But more recently I have experienced abysmal service. Missing meals, delays & staff completely un-helping & un-caring when such mishaps arise. I hope for the sake of others, I am catching Thai Kitchen on really bad days. 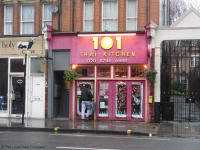 101 Thai Kitchen is a hidden bastion dedicated to traditional Thai cuisine in a modest restaurant located near stamford brook tube station. The menu consists of a lot of classic thai dishes and an excellent selection of salads, grilled / steamed fish and stir fry options which you won't find in any other Thai restaurants around London. The winner of the day is the chalk board menu written in Thai; if you are lucky enough to get a waiter or waitress that doesn't say 'you won't like this its for Thai people' you will find an array of options including various pork based specialties (there is no pork on the main menu, only the specials) and classic thai recipes such as fermented fish guts. 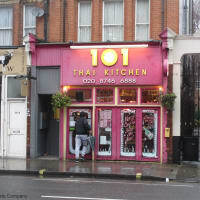 101 Thai kitchen is extremely reasonable in price, and well spiced (beware, the salads are as hot as they are supposed to be and haven't been dulled down much, if at all, for the non thai patrons). The curry's are perfect, the salads well balanced, the service friendly and the dishes are all in proportion. You won't find a better thai option at this price (approximately £15 per person excluding drinks). I live in Hackney and will gladly travel from one side of London to the other to eat at this fantastic restaurant.